Edward Lear, Thermopylae, 30 June 1848. Pen and brown and blue ink with watercolour over pencil, heightened with white on grey paper; inscribed lower right: 102 / Thermopylae / 30 June 1848; further inscribed with artist’s notes. 175 by 28 mm. 1. V. Noakes, Edward Lear Selected Letters, London 1988, p. 80. Sotheby’s Old Master & British Drawings including French Masterworks from the Dormeuil Collection. 2. Lady Constance Strachey, Letters of Edward Lear, London 1907, p. 11. 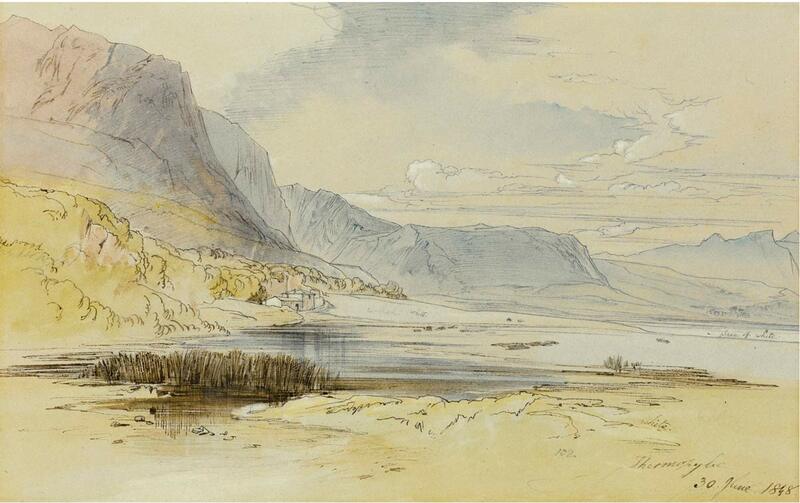 This entry was posted in Edward Lear and tagged Edward Lear, Greece, travel, watercolours. Bookmark the permalink.